Semtech has announced the addition of GPS-free geolocation capability to its LoRa wireless RF solution for IoT applications at Mobile World Congress Shanghai. The added feature is compatible with all existing LoRaWAN end nodes and the version two LoRaWAN gateway infrastructure reference design announced by Semtech earlier this year. Multiple gateway manufacturers have implemented the LoRa geolocation reference design since its introduction in March 2016, and initial deployments are starting now with large-scale deployments expected for the second half of 2016. The LoRa geolocation solution is positioned to serve this need by offering extremely power efficient, GPS-free location capability for a wide variety of markets, including automotive, logistics, consumer, insurance, agriculture, construction and others. 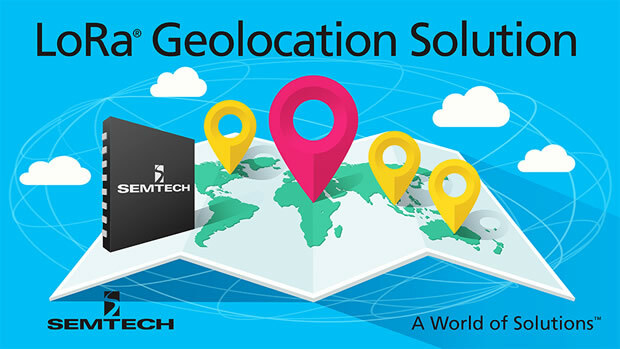 Semtech’s LoRa geolocation solution is enabled by version two LoRaWAN gateways that share an accurate, common time base and add an ultra-high resolution timestamp to each received LoRa data packet. Each base station will report the time of arrival and supporting metadata enabling location solvers based on differential time of arrival (DTOA) algorithms to determine the end node position to the nearest block. “The new LoRa geolocation service will enrich the existing LoRa service. The ability to manage assets by knowing their locations will drive new business opportunities for existing and new organisations in the market. The LoRa geolocation service will further optimise processes, save costs, and help companies and governments in becoming smarter and more efficient,” said Jasper Snijder, EVP New Business from KPN. Low cost – All LoRa-enabled end nodes are supported natively, which eliminates any impact on the bill of materials. Extremely power efficient – Network-derived geolocation does not require any additional processing on the end node maintaining the standard extremely low power consumption of LoRa. Optimal security – Over-the-air messages do not contain any positioning information. On top of the standard 128 bits AES encryption, this prohibits access to, or vulnerability of, asset or personal geolocation information.